You know, how sometimes magic touches your life? When impossible things turn into reality, without much effort or try. This is what happened to me and a bunch of other people, when we started to build the cob oven Archie. There are hundreds and thousands of cob ovens in the world, but so far there was none in Finland. By coincidence, or fate, I met Katharina, who wanted to have some good bread, and after that, as they say, the rest is history. 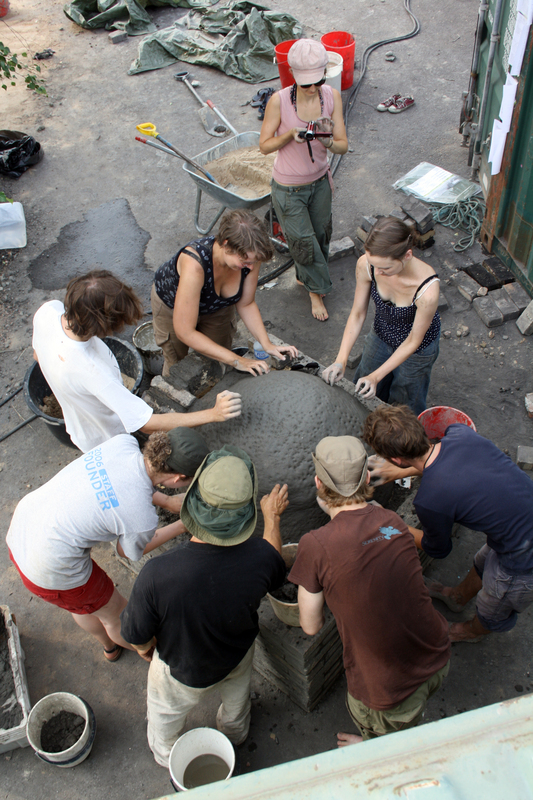 A cob oven is a simple, traditional oven, made of mixed sand and clay. Everyone told us that it is impossible to build an oven like this, at the end of August, in Finland. 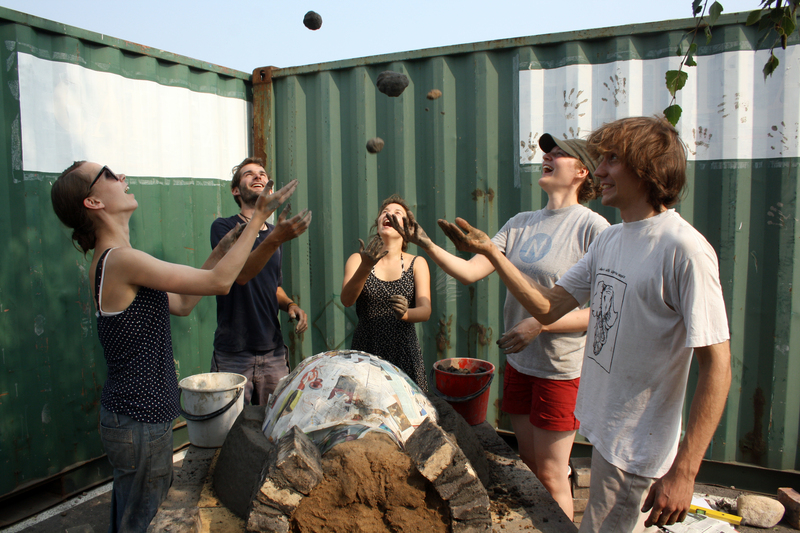 “It won’t dry, it’s too late in the summer”, “You won’t get a permission”, “there is no such clay for sale”, but somehow, via open platforms, like the Public School Helsinki website, facebook and the generosity of Hub Helsinki, we found enthusiastic people, clay, space, cars, trailers, bricks and a place for our oven, in the area of construcion area of a new urban district. We scavenged the materials, build it, and named it Archie after the nice arch Daniel made. And the weather was perfect, and we, individual people, became the Tribe of Clay, the Tribe of Archie. Oh happiness, to build something together, to celebrate together, to share food and laughter. 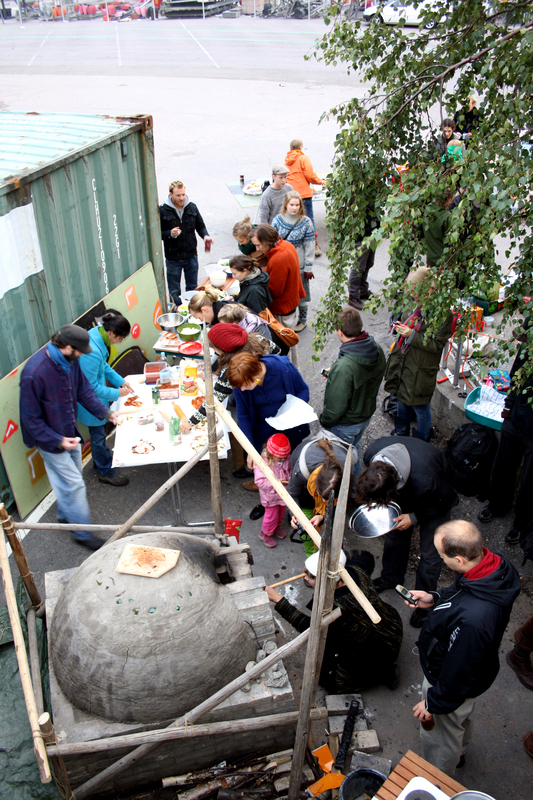 Last weekend, we baked perhaps 70 pizzas at the Dodo urban harvest party and Katharina organized an art workshop with baking rieska, Finnish flat bread (check out her blog on food related art happenings in Helsinki!). The oven works like a dream, and somehow, after the magical building process a good flow continued in my life. All kinds of gifts were shovered on me, from jars of mint on my windowsill to phonecalls from just the right people, and even some much more substantial things… but isn’t it strange, how sometimes it is so difficult to accept these gifts from the universe? You just don’t believe you could be worth the abundance and good luck fate is throwing on your way, and so you just block the flow with your own unwillingness to accept and let go with it. But anyhow, now in my life there is a lovely group of new friends and the most wonderful wood oven at just a 15 minute bikeride away! Urban gardens and an oven, what next? Be ware, Helsinki, we are going to change you for good! 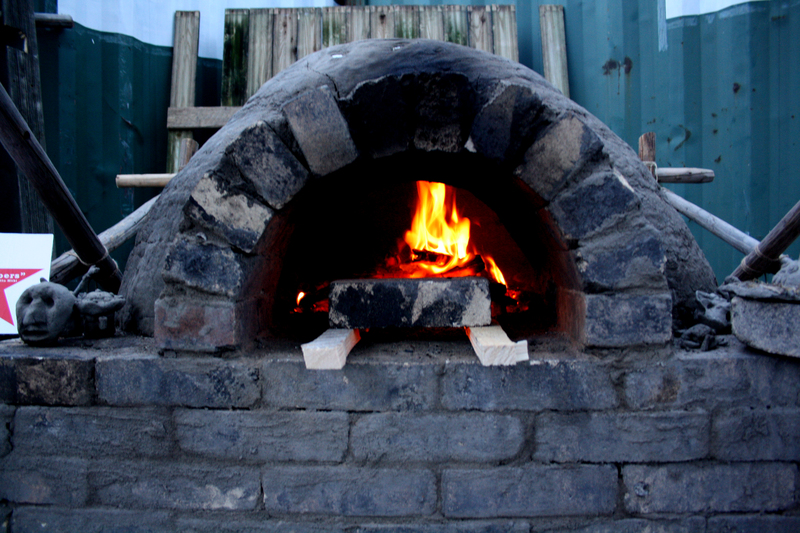 Start by building an oven… well, I’m kidding but it really isn’t so difficult! Very good, detailed instructions can be found at the Clay Oven. And if you want to use the oven Archie in Helsinki, you can find more information on our blog Stadin uuni on how to make a reservation. 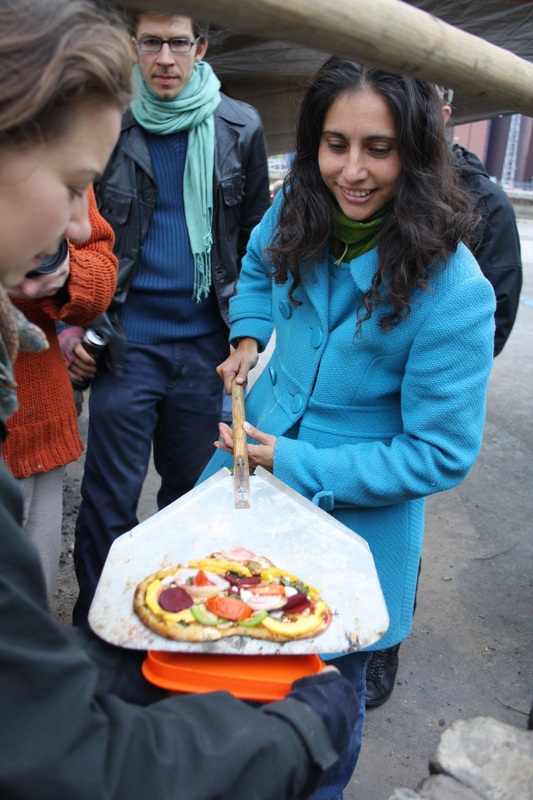 We hope that the oven will birth a whole new culture of urban social baking events, so feel free to contact us! My vegan pizza was made using a sourdough starter and some nice vegetables that were a product of urban farming. Here in Finland pizzas are always suffocated with cheese, but in Italy where they originate, there is a lot of delicious pizza baked without cheese. Mix the ingredients in a bowl and cover with a cloth. Wait until the following day. The flour you are using should have at least 12% protein in it. I used extra fine wheat flour, but also other types of protein – rich wheat flours could be used. Mix the flour, salt and olive oil into the dough, and knead it for a few minutes. Let the dough rise for an hour or two. If possible, at least once this time fold down the dough and let it rise again since that enhances the rising. Mix the ingredients in small cooking pot, and let simmer on low heat at least 15 minutes. 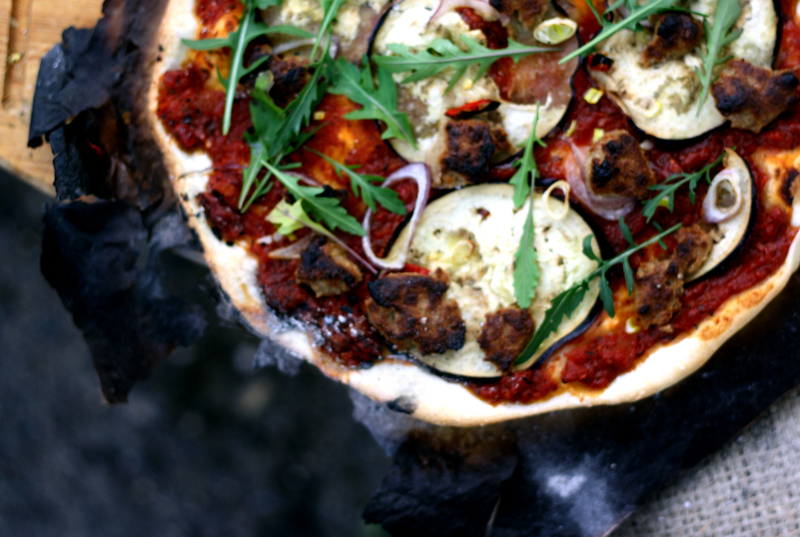 Fire your oven until very hot (300 ºC about), remove the coals to the sides to make room for your pizza. 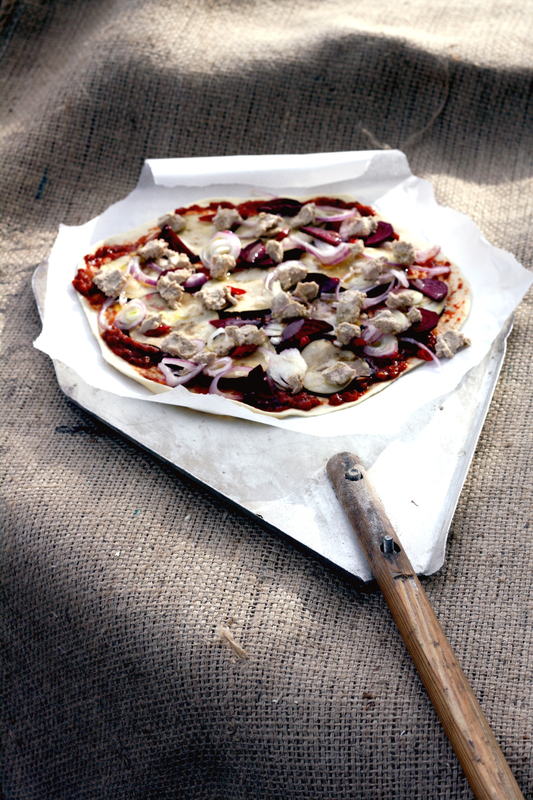 You can either use a lot of flour or baking parchment to be able to move the pizza from the pizza peel. 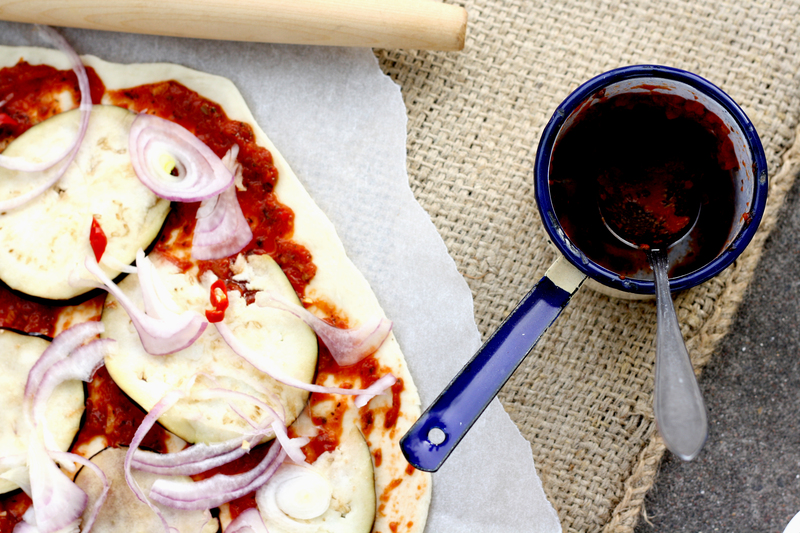 Roll out the pizza dough, very thinly, and spread the tomato paste and other fillings on it. Insert the pizza in the oven, and bake for a few minutes until it looks done, and the edges are puffed. 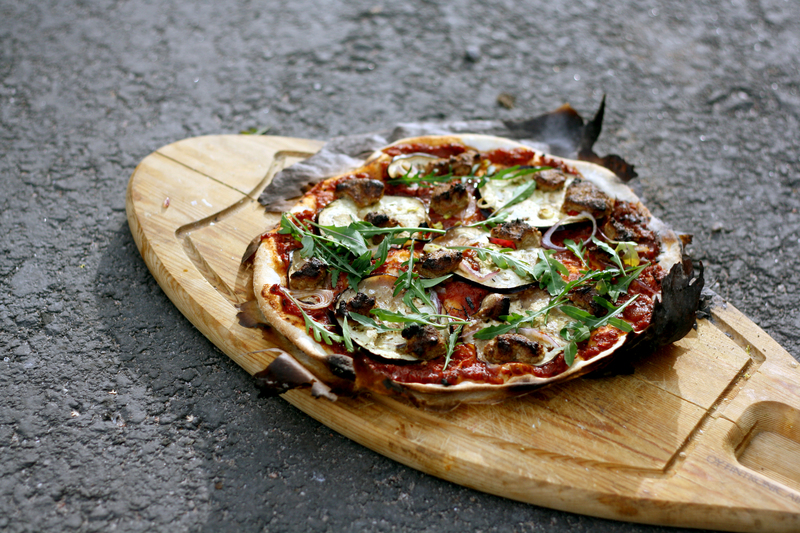 Decorate the pizza with fresh arugula or basil. Devour while still hot! There is an old story that tells about the Spring Equinox: Hades, the god of Kingdom of Death, stole the beautiful maiden Persephone down to his realm to be his wife. Meanwhile her mother Demeter, who is the Goddess of Earth and all living things, made everything barren and dry in her mourning. Finally Persephone was allowed to return to stay in in the Land of Living every half of the year, and her returning was the coming of the spring, when her mother made all flowers bloom in her wake. So since now it is the time of Spring Equinox, I wanted to make a salad to celebrate the oncoming Spring, even if the land is here in the North not quite blooming yet… This salad is very sweet, like the Maiden Persephone is sweet returning from the Land of the Dead, and the first signs of spring are sweet to the soul. First I prepared the caramelised walnuts. This I did simply by adding all the ingredients for the caramelised walnuts on a frying pan, and frying them for about 5 minutes, or until the sugar was caramelised. This means it becomes sort of syrup – like. The sugar burns easily so I tried to concentrate. Then I poured the mixture onto a pan that was covered with baking parchment to let it cool down. Then I made the vinaigrette by mixing all the ingredients with a hand held mixer. I suppose in order to be very gourmet you should actually puree the rasberries using a sieve, so that you’d get rid of the seeds, but who cares? Then I chopped all the other ingredients for the salad and took out the seeds from the pomegranade, being careful not to take out any of the white skin that is inside the fruit, since it is very bitter. Then I assembled the salad by mixing all the ingredients and the dressing.